Western Montana Clark Fork Riverfront land with 3/4 mile river frontage, Beautiful riverside level benches building sites overlooking the river and mountains. Great area for fishing, hunting, rafting. 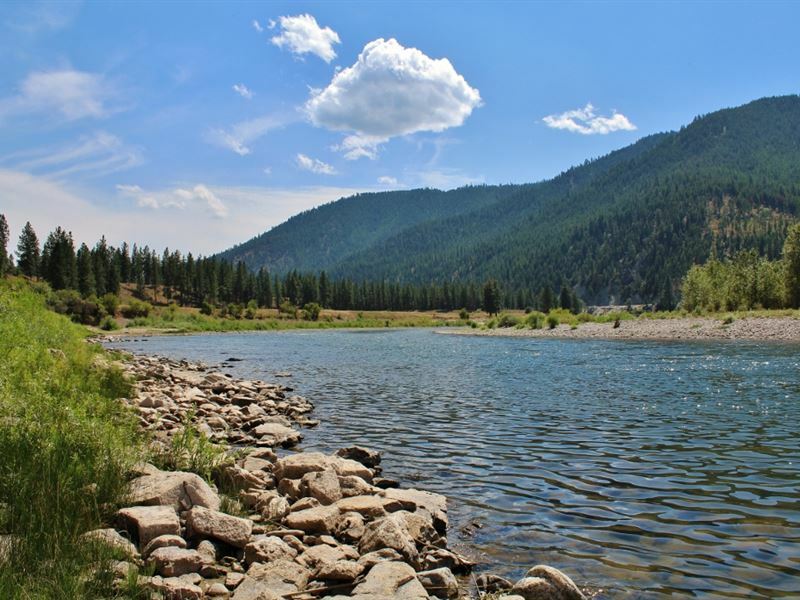 Beautiful 95.61 acres on the Clark Fork River of Western Montana with approximately 3/4 mile of river frontage. Beautiful riverside building sites on level benches well above the floodplain with stunning river and mountain views. The land is a nice mix of meadows, trees and river frontage. Great location just a few miles east of Superior with grocery and hardware store even a hospital and paved airstrip. Less than an hour to the Missoula Airport and all the amenities including the University of Montana and Costco. Excellent access with power adjacent to property. Area of excellent trout fishing and rafting. Wildlife include Waterfowl, Eagles, Osprey, Deer, Bear and Elk have all been known to frequent the property. Contact your Realtor or John Horton for a tour of this very nice riverfront land.